From the highly acclaimed author of The Myth of You and Me comes a new novel about a young mother who finds her identity rocked to the core when her writer-husband reveals his next novel about infidelity isn’t entirely fiction. 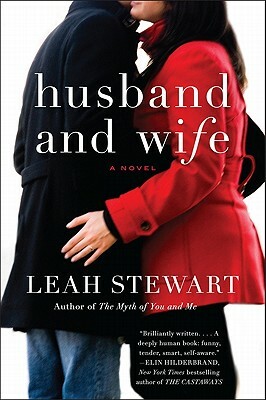 Fans of Meg Wolitzer, Ayelet Waldman, and Marisa de los Santos, as well as memoirs like Happens Every Day and Perfection, will love Leah Stewart’s Husband and Wife. What is the significance of the title—what does it mean to be a "husband and wife?" How do we reconcile our romantic ideals about marriage with the mundane realities of sorting socks, changing dirty diapers, cooking dinner? Describe Sarah and Nathan's marriage. Is this husband and wife a good fit? How did marriage change them from when they first met? Does marriage have to transform us as individuals? How do we retain who we once were—and the promise of the dreams we once had—as the years pass? Should we even want to? Talk about Sarah's reaction to Nathan's news. Are you sympathetic to her response? She, too, has a secret—one involving feelings for another man—that she has been keeping from her husband for years. What affect does this have on her marriage and the events that unfold? Did Nathan's behavior give her license to act as she did, or do you think she might have turned to Rajiv at some point even if Nathan never cheated? At the beginning of the story, Sarah reveals a little about herself. "Now I'm thirty-five, and these days most people would call me a working mother, a term I don't much like. That I have a job and two small children is a better, if less succinct, way to put it." Having gotten to know her over the course of the novel, why does the term "working mother" bother her? Do you think it's an accurate description? What's the difference between being a working mother and having a job with children? She also shares insights into the path her life has taken and its impact on her relationship. "When we met, I was a poet. When Nathan confessed, I was a mother, a business manager, a wife. I'm not saying I held this against him. I'm saying he held it against me." Do you agree with her assessment? What is your opinion of Sarah? What kind of a wife and mother is she? Why did she stop writing? Does Sarah bear any responsibility for her husband's betrayal? Do we choose our roles—victim, cheater, responsible one, free spirit, artist, employee—or are they thrust upon us? What is Sarah and Nathan's relationship with their elderly neighbors? When she learns they have been married for fifty-three years, Sarah wonders, "Was this a good thing? A bad thing? Just a fact?" How would you answer her? Should marriage last a lifetime? Sarah ponders Americans' ambivalence and confusion about growing up. "We say that growing up is all about disappointment, even as we insist to our young that anything is possible. ‘Follow your dreams,' we say, and then we spend our free time making fun of the blinkered contestants on American Idol." Why do we associate adulthood and disappointment? What does it mean to "follow your dream" or to "do what you want"? Should we encourage ourselves to seek fulfillment if it may hurt others? Sarah thinks of herself as a grown up. Is she? What does being an adult mean? How does aging—and the experiences that go with it—color our outlook on life? How do we cope when the realities of middle life don't match up with the dreams of our youth? Husband and Wife also touches on the idea of happiness. What is happiness? Are we too focused as a society on the notion of happiness? Why? Are Sarah and Nathan happy? Were they before Nathan's confession? Is happiness possible after infidelity? Why does Sarah go to Austin? What does Rajiv offer her that Nathan does not? Do you think Sarah treated Rajiv fairly? What about Nathan? Does he deserve fairness or consideration in light of what he's done? Does Sarah ultimately forgive Nathan's transgression—is she capable of forgiveness? How do you think Nathan would react if he knew of Sarah's own betrayal? Why doesn't she tell him? Do you think she may ever confess to him?